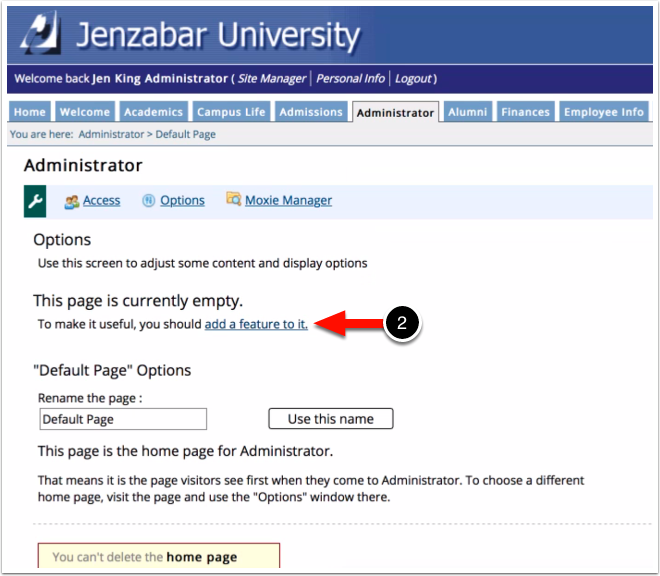 Jenzabar requires that you create or maintain a tab in which your dedicated Chalk & Wire or Learning Tools page will "live". 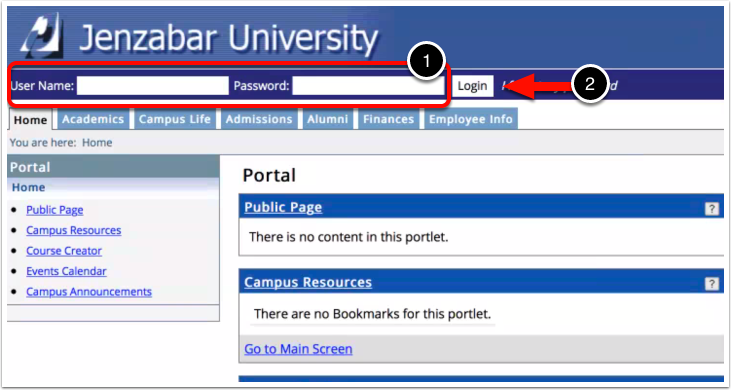 It is recommended that you create an "Administrator" tab to use for this purpose. 3. 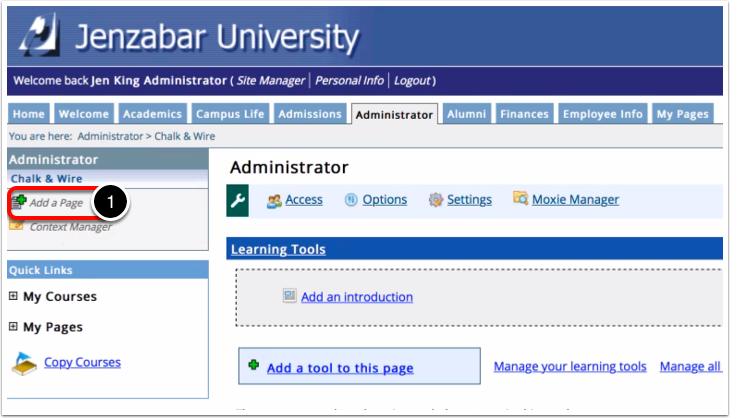 Click on the Administrator tab, or whichever tab you will use to maintain your Chalk & Wire learning tool. Option 1. Create a dedicated "Chalk & Wire" page that will be used to maintain your link between Jenzabar and Chalk & Wire. Option 2. 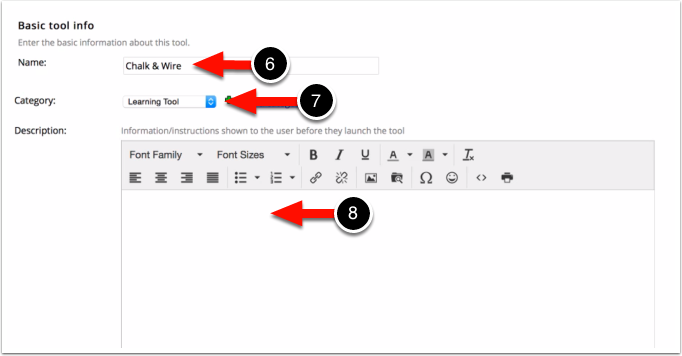 Create a "Learning Tools" page that will be used to maintain Chalk & Wire, along with any other learning tools that you might have linked to Jenzabar. 1. Click on the Options link. The "Options" page will indicate that it is currently empty. 2. Click on the Add a feature to it link. 3. Click on the Expand to view the list of options link beside Learning features. 4. Click on Learning Tools. The only information on the next screen that should be changed is the name of the page. It will, by default, be named "Default Page". 5. Rename the page to say Chalk & Wire or CWPro and click on the Use this name button. 6. Click on the Back to [Page Name] link. 1. Click on the Add a Page link. 2. Click on the Expand to view the list of options link beside Learning features. 3. Click on Learning Tools. 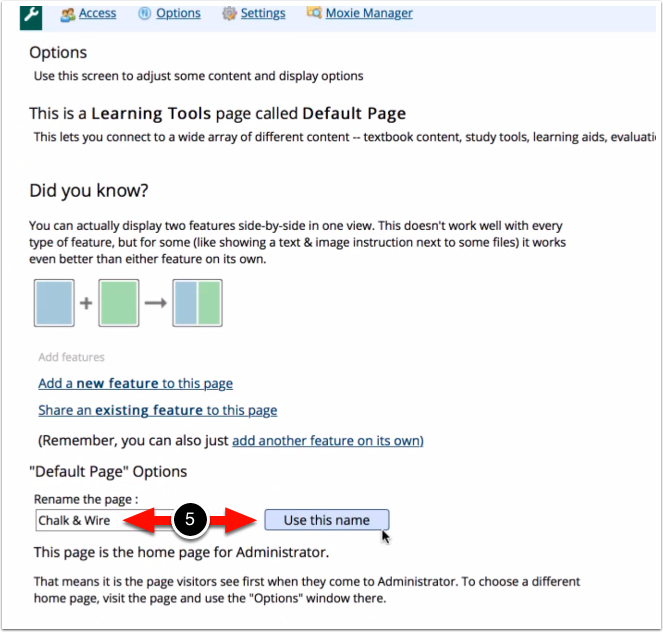 Regardless of the option you chose, you will need to add a Learning Tool to the page. 4. Click on the Add a tool to this page link. 5. Click on the Add a new learning tool link. On the next screen, you will be see a "Basic Tool Info" heading. 6. Enter a Name for the tool. We recommend "Chalk & Wire" or "CWPro". 7. 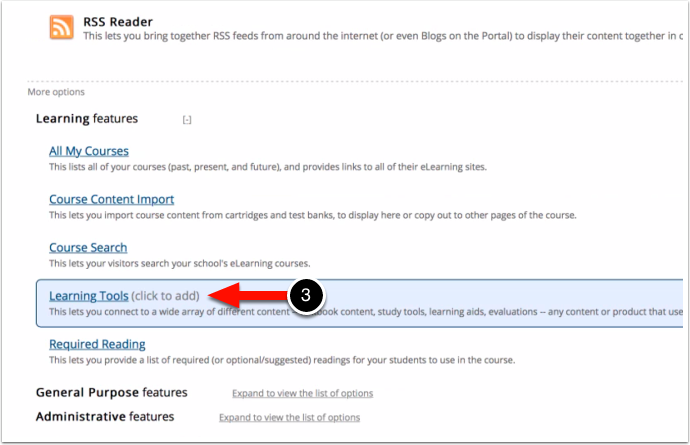 Using the Category drop-down menu, select Learning Tool. 8. Optionally enter a Description for the tool. 9. 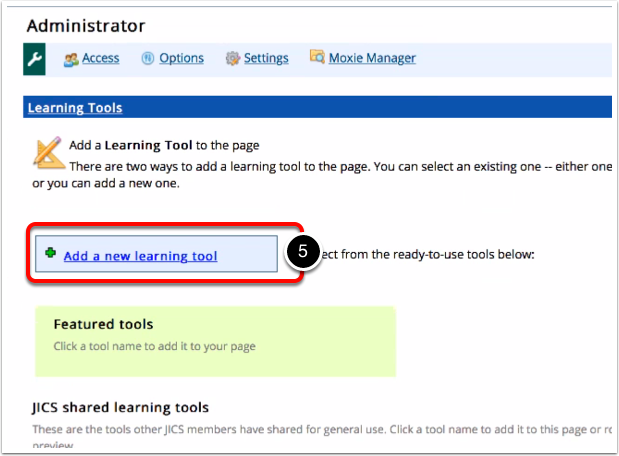 Select both Share this tool with other JICS members and Add this to the list of featured tools highlighted on activation screen. These options will allow other users to generate LTI and/or SSO links to Chalk & Wire/CWPro. Please note that the URL in the image differs from the URL in the text above. Please use the text provided above as the text from the image will not function correctly. 11. Enter your Key and Secret. This information will be provided to you by Chalk & Wire/CWPro. 12. 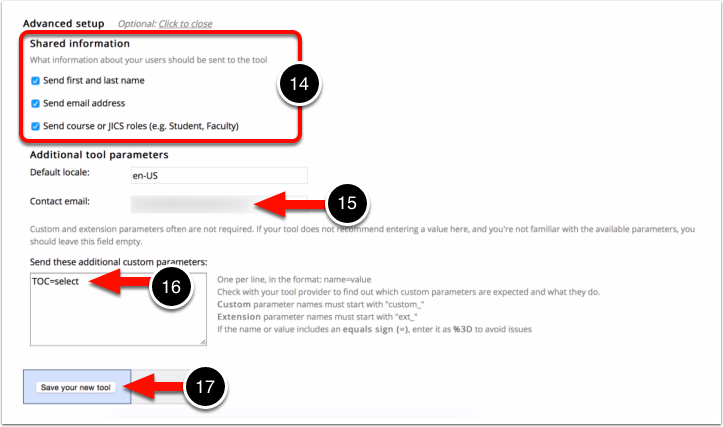 Use the checkbox to select This key & secret are "domain-level" and can be reused for other tools in the same domain. 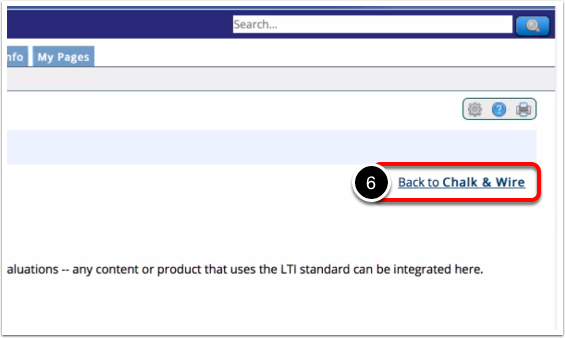 Similar to the sharing option we selected in step 9, this will allow users to access the learning tool and generate LTI and/or SSO links to Chalk & Wire/CWPro. 13. 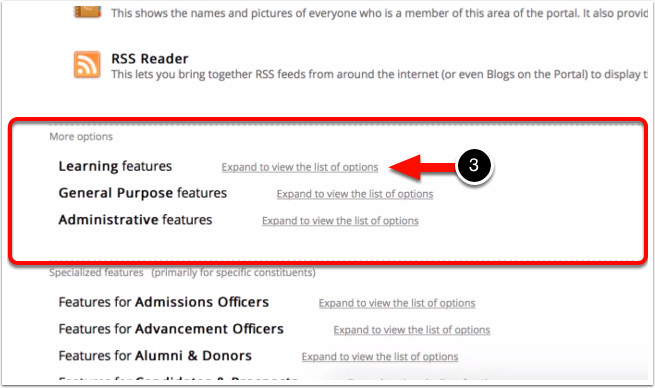 Select the option Show the tool within the JICS page. 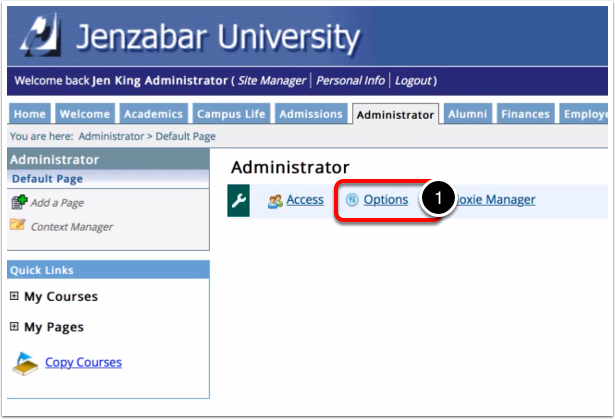 This will allow Chalk & Wire/CWPro to open within your Jenzabar window rather than opening in a new tab or window. 15. The Contact Email will default to whichever user is creating/setting up the tool. Optionally enter a different email address. 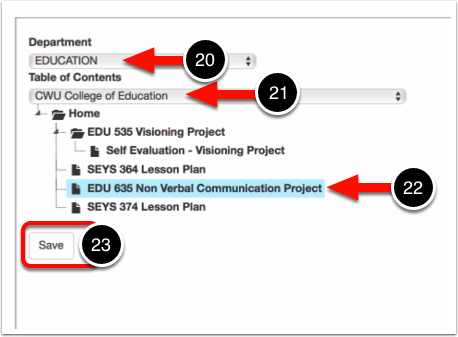 toc=select will allow you and/or your faculty to create links that will direct to a specific section of a Table of Contents in Chalk & Wire/CWPro. toc=assignment will allow you to use this Placement in an assignment that does NOT link to a TOC but instead links to an actual assignment in Chalk & Wire/CWPro. toc=0 will allow you to use this placement as an SSO link that will direct all users to their default landing tab (Dashboard) in Chalk & Wire/CWPro. 17. Click on the Save Your New Tool button. You can create a learning tool for each use-case scenario in Jenzabar. 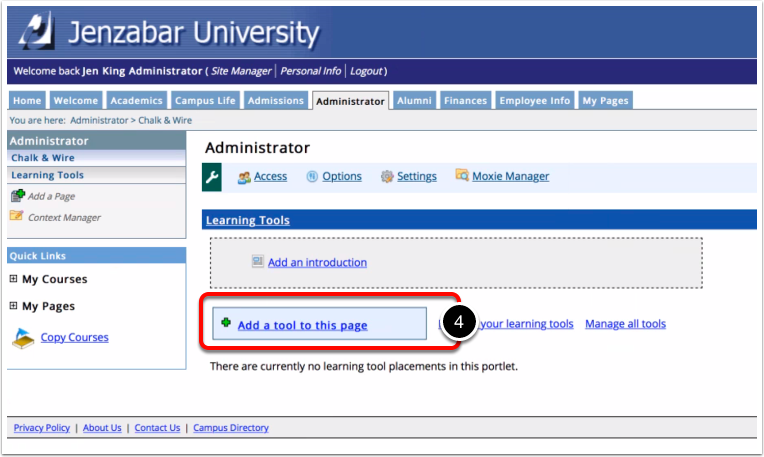 Faculty can select the appropriate learning tool (LTI vs. SSO) to their course depending on their intended use/purpose. It is recommended to only make as many placements as needed in order to avoid potential issues related to selecting or adding the wrong placement to course content. 18. Enter "Go to Chalk & Wire" in the Launch Link field. This will override the system default, which would read "Launch the Chalk & Wire/CWPro". 19. Click on the Save Your Settings button. Your selections here will not determine the table of contents and/or section for any assignments. This is simply to ensure that your link to Chalk & Wire/CWPro is functional. 20. 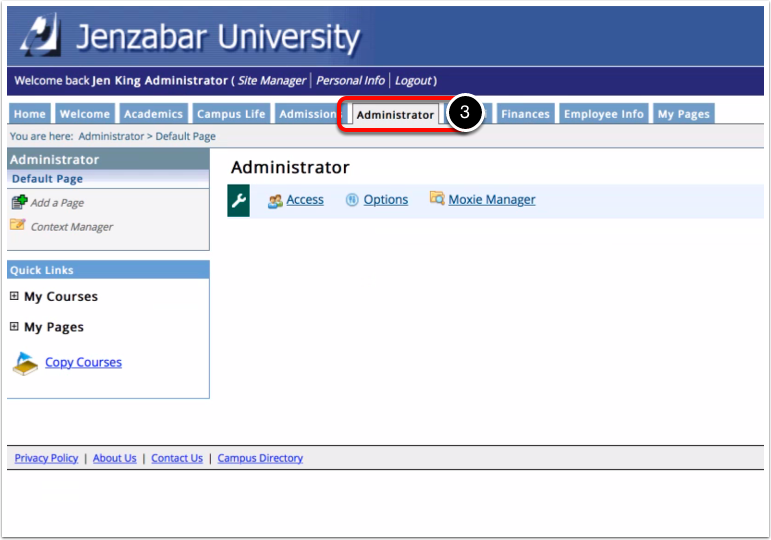 Select the Department that contains the table of contents to populate the Table of Contents drop-down menu. 21. Select the Table of Contents or Assignment from the drop-down menu. 22. If you are linked to a Table of Contents, select the Table of Contents Section that corresponds to the Assignment Link that you've created. 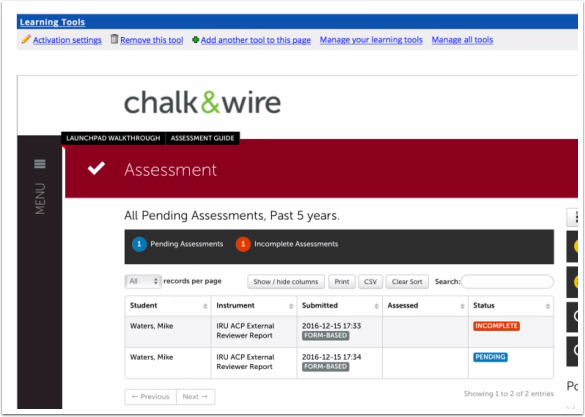 Chalk & Wire/CWPro will open directly within your Jenzabar screen, as it will for students, allowing them to submit for assessment.